This study makes 5 contributions for policymakers. First, Islamic State is like the Islamic Republic of Iran. Each advocates a world without frontiers, oppresses dissidents, and lacks popular support. Second, the study updates a prior book, “Arab Rebels,” in light of creation of Islamic State as descendants of the Iranian regime. With the 1979 Revolution in Iran, these protégées received oxygen and rose as al Qaeda and Islamic State; Iran’s narrative of a borderless caliphate compares favorably with the storyline of Islamic State, which is also a world without frontiers. Third, this work shows that the Iranian resistance is the ideological antithesis of Islamic Republic of Iran. Tehran is misogynist, flouts the rule of law, and oppresses minorities; the resistance treats women and men equally, practices rule of law, and adheres to majority rule in word and deed. Fourth, “Islamist Movements” provides a point of departure for national and international parliaments to hold hearings to identify the enemy as militant Islam in its state form (Iran) and nonstate version (Islamic State). Fifth, a Ten-Point plan for bringing democracy to Iran poses a threat to the survival of the clerical regime. The National Council of Resistance of Iran, including its main unit, People’s Mujahedeen of Iran/Mujahedeen-e- Khalq, chart a political process toward a free Iran. The Associated Press and the Washington Times both covered the attack. Agence France Presse and the conservative news service CNS, reported bipartisan congressional calls for action. Digital Journal included a link to detailed video footage. Another clip shows the scene shortly after the attack. The calls included two Republicans, House Foreign Affairs Committee Chair Ed Royce and Ileana Ros-Lehtinen, as well as a Democrat Rep. Judy Chu. Critics of the Mujahideen-e Khalq (MEK) might say that the media coverage is really not independent because each one merely quotes what the Iranian dissidents said. But I say that when the mainstream media gives so much ink to a story, it is some evidence that they take the allegations seriously. Critics might also say that members of Congress supportive of the MEK are acting in the interest of campaign contributions. But I say that the burden is on the naysayers to provide the evidence linking Royce, Ros-Lehtinen, and Chu as being “bought off” by the MEK. I am personally aquatinted with each of them, and I am impressed with their integrity and commitment to the MEK especially on humanitarian grounds. The attack is the epitome of a humanitarian tragedy. Why is Iran targeting its opposition? Dissidents are trying to block Tehran’s aspirations to control Baghdad and Damascus, where the United States is fighting the Islamic State. Washington’s evolving strategy is dead on arrival on the Hill unless the Obama administration reaches out to the opposition and sees Iran as a threat across the porous border. So how can it counter the threat from Iran? 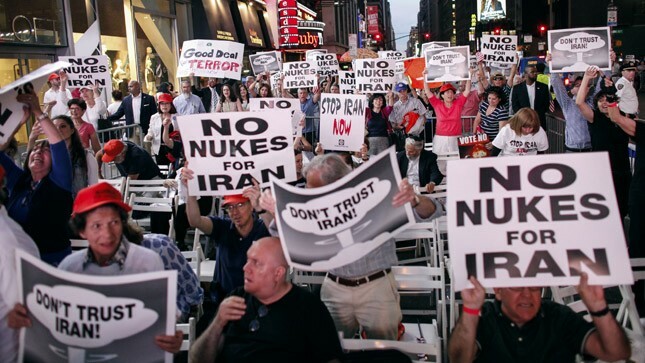 Align with others opposing Tehran and the bipartisan congressional coalition sharing that view. Both Adel al-Jubeir and Netanyahu have previously distanced themselves from the MEK on different grounds. On one hand, Saudis attribute too much power to the MEK because of their role in bringing down the Shah — if their supporters can topple the Shah, perhaps they will side with those who wish to bring down the Kingdom. On the other hand, Netanyahu believes that the MEK is of too little consequence to cause even further trouble with the State Department, which fails to reach out to the MEK. Both assessments are based on my interviews with high level Saudis and Israelis. My take is that the MEK is neither strong nor weak based on indicators like the following. According to my research, reported in my book Arab Rebels and Iranian Dissidents, during mid-2000, the Iranian regime paid more attention to the MEK than to all other groups combined, created expositions in every major city of Iran to warn the youths of the pro-democracy views of the organization, and paroled Ayatollah Ali Akbar Hashemi-Rafsanjani’s daughter from prison because she was learning too many subversive ideas from MEK prisoners. In the expositions and the early release, Tehran’s tactics against the MEK backfired. On Apr. 29, the House Foreign Affairs Committee held a hearing, “ISIS: Defining the Enemy.” Maryam Rajavi is President-Elect of the National Council of Resistance of Iran (NCRI), the coalition of which the MEK is the largest unit; she testified from Paris. Her written testimony showed how Tehran is an Islamist epicenter of terrorism to establish an Empire without borders and called for empowering the democratic tolerant Islam she represented. Critics might argue that it is easy to promise democracy and criticize the regime as being an Islamist epicenter. There is “evidence” the MEK is an intolerant cult, which forces its members to drink the proverbial Kool-Aid. I have interviewed family members of a young girl who committed suicide when Maryam Rajavi was in a Paris jail. The parents told me they did not believe their daughter had done so because of pressure from the MEK. Indeed, when the jailers informed Rajavi of the suicide, she immediately issued a statement saying that she neither sanctions such behavior nor wishes anyone else to do so in the future — not the words of a cult leader. I grant the jury is out whether the MEK will be as tolerant when the regime falls as Tehran has been intolerant towards the MEK. Think of a soft landing when the regime falls as in the disintegration of communism in Europe or a hard landing like the one in Libya. If soft, then I expect a tolerant MEK. Professor Raymond Tanter appeared on World Insight on 05 October 2015. 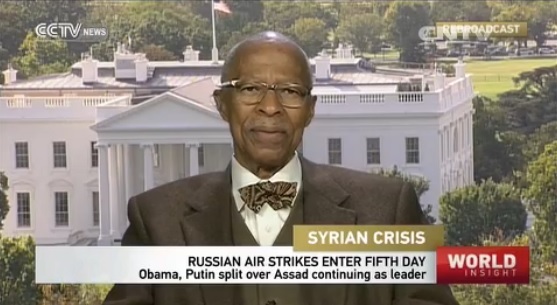 At the end of the World Insight program 19:08 mins, Prof. Tanter said that National Council of Resistance of Iran intelligence exposes Iran role in Iraq to counter Intel of Moscow, Tehran, and Baghdad.